Bloodwood “mallee” comprised of thousands of stems which shoot from giant ungerground lignotubers thousands of years old. 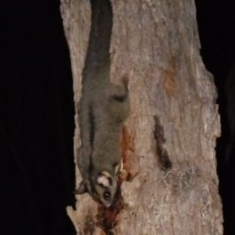 An important feeding habitat of the local sugar glider population. 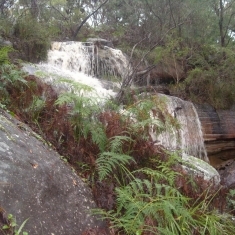 Spring Gully, Bundeena. 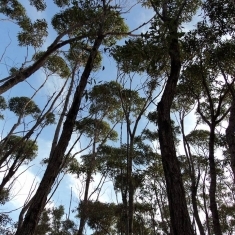 To the east and south of the southeastern corner of Bundeena grow stands of the eucalypt Bloodwood Corymbia (syn. Eucalyptus) gummifera. These stands have outstanding conservation value and should be very carefully protected and conserved. 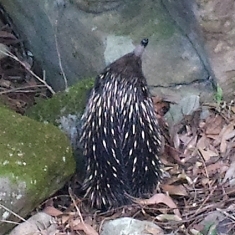 Some of them are contained within Royal National Park whilst others are to be found in private lands in the southeast corner of Bundeena. The Scouts Association previously owned one private block and Sutherland Shire Council owns the other. It is likely that some stands were destroyed in the past during the construction of houses in this area of Bundeena. 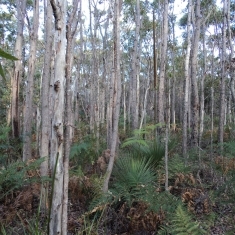 These groves of Bloodwood are largely growing on ancient sand dunes across the area on public and private lands but some extend onto soils derived from a base of Hawkesbury Sandstone found on the land previously owned by the Scouts Association and that presently owned by Sutherland Shire Council. Here the dunes end and spill over onto the surrounding land. These sand dunes are of great conservation value in themselves being amongst the best of their type in Australia and amongst the best conserved. Their integrity should not be compromised. The origin of these dunes is not clear. Whereas the rise in sea level during the Holocene certainly pushed sand across the continental shelf onto the present shoreline over the last 7500 years, how sand could have driven across lands covered by dense forests to the present location remains unclear. However, carbon 14 dating of the dunes from Jibbon gives an age of 10,000 years when the sea level was well below its present level and several kilometers off the present shore. Also, there are much older TL dates from dunes at Kurnell on the other side of Port Hacking. It may well be that the high dunes in Royal are considerably older than 10,000 years. 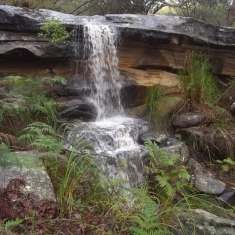 The Kurnell older dates range from 14,000 to 26,000 years1. There are Late Pleistocene dunes at high levels though this is based on their very well developed organic soil profiles (coffee rock), which are typical of pre-Holocene dunes, but they have not been dated. Another interesting fact is that the dunes are aligned SE-NW. Considering the prevailing winds dunes pushed up from Port Hacking should be aligned NE-SW, this is a significant problem to be solved that should be researched. Having these dunes conserved in Royal National Park hopefully protects them to be studied some future time and assist our understanding of Sydney’s Pleistocene and Holocene geomorphology and climate and provide important climate change information. The history of sea level changes over the last 10,000 years is a complex matter and not totally understood. There are many factors involved. The Royal National Park sand dunes have already contributed very valuable information on these matters and offer a great deal more once the relevant research is begun in this area. Their scientific value in this regard is very high. 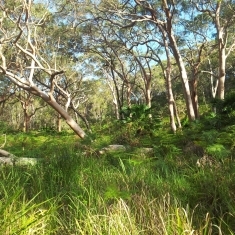 The dunes overall and in this area and immediately adjacent Hawkesbury Sandstone habitat provide important eucalypt habitat in Royal National Park additional to that conserved and world heritage listed in the Greater Blue Mountains World Heritage Area GBMWHA, which contains ‘a wide and balanced representation of eucalypt habitats’ as part of its Criterion (ix) for World Heritage Listing. They also contribute to the outstanding diversity of habitats and plant communities that support globally significant species and ecosystem diversity. Significant samples of the Australian continent’s biodiversity, especially its scleromorphic flora, occur on the sand dunes in this area. The plant species Bloodwood Corymbia gummifera a eucalypt occurs in important stands in this area. 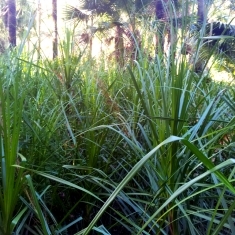 The uniqueness of their sand dune habitat here has led individuals of this species to adapt and develop a mallee growth form with lignotubers of truly gigantic size compared to those found in other habitats. 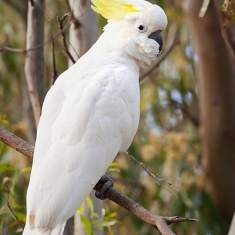 These individuals, and the groves they live in, are the best of their kind in Australia and the world. They are of outstanding conservational significance. Bloodwoods have a very diverse phenotypic expression and, depending on the habitat that they live in, grow as a range of growth forms or plant life forms from small mallees to mallees with giant lignotubers such as these, tall shrubs, woodland trees, forest trees and giant forest trees. 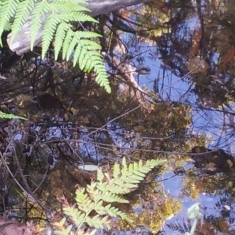 The Royal Reserves contain all these Bloodwood life forms except the giant forest tree type. Here we have some outstanding catenas of habitats and communities from Sand Dune Heath to Coastal Sandstone Plateau Heath, Coastal Sandstone Ridgetop Woodland and Coastal Sandstone Gully Forest. There is a corresponding catena of Bloodwood genotypes in these adjacent communities with an outstanding catena of phenotypes. We have right here a truly outstanding and marvelous example evolutionary processes in action, of changes in genetic composition and expression as phenotype and subsequent physical form of the eucalypt Bloodwood Corymbia gummifera. 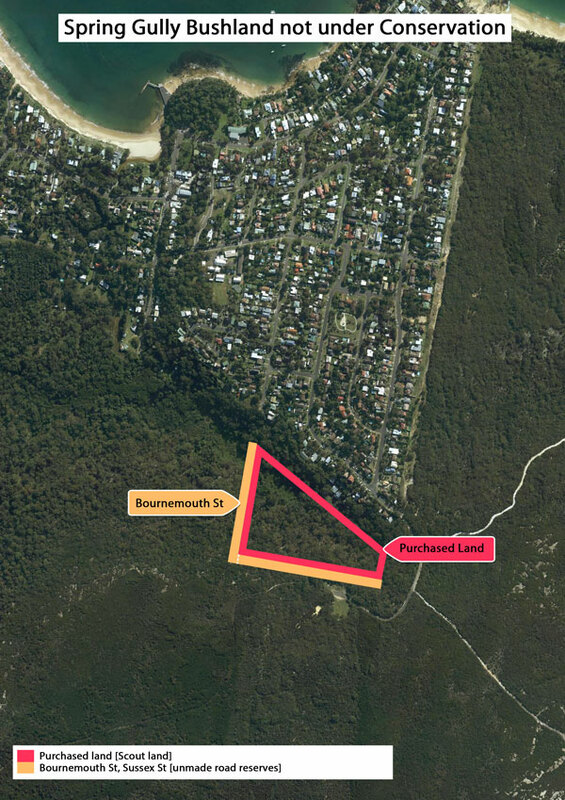 This example extends over lands in Royal National Park and private land owned by Sutherland Shire Council and that previously owned by the Scouts Association. These lands are of outstanding conservational value and should be protected to the maximum. 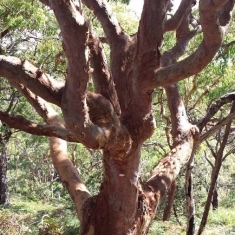 The Bloodwoods on the private land are not ‘rubbish trees’ as the current landowner has described them but are a very important part of the catena of the Bloodwood genetics and phenotypic expressions found here and are very valuable in this regard. 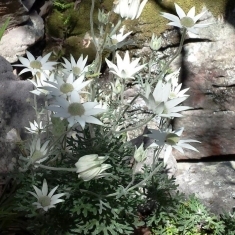 If properly protected the area should continue to play a vital role in providing opportunities for adaptation and shifts in range for all native plant and animal species within it, allowing essential ecological and evolutionary processes to continue. The area‘s integrity depends upon the complexity of its geological structure, geomorphology, fire regime, soil nutrient status and structure, and drainage regimes which have created the conditions for the evolution of its outstanding biogeodiversity and which require the maximum level of protection for such an outstanding valuable resource. 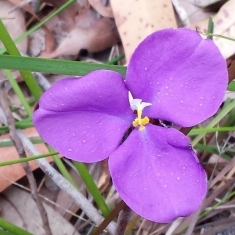 The individuals of Bloodwood with their unique and special giant lignotubers contribute significantly to the outstanding scleromorphic features found in the vegetation of Royal National Park. As said before, they contribute to the outstanding diversity of plant communities that support globally significant species and ecosystem diversity. 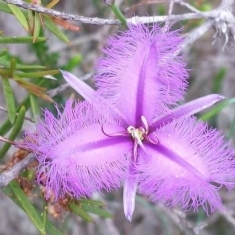 They are significant samples of the Australian continent’s biodiversity, especially its scleromorphic flora. These values outlined here contribute to Criterion (x) for World Heritage Listing of Royal National Park. Their rare habitat is also of outstanding value. 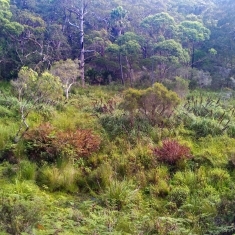 The mallee Bloodwoods and other mallee eucalypts in this area are outstanding and representative examples of the evolution of the evolution and adaptive radiation of the genus Eucalyptus and eucalypts (Corymbia is a eucalypt and was formerly of the Eucalyptus genus), and eucalyptus dominated vegetation of the Australian continent. These values contribute to Criterion (ix) for World Heritage Listing of Royal National Park. 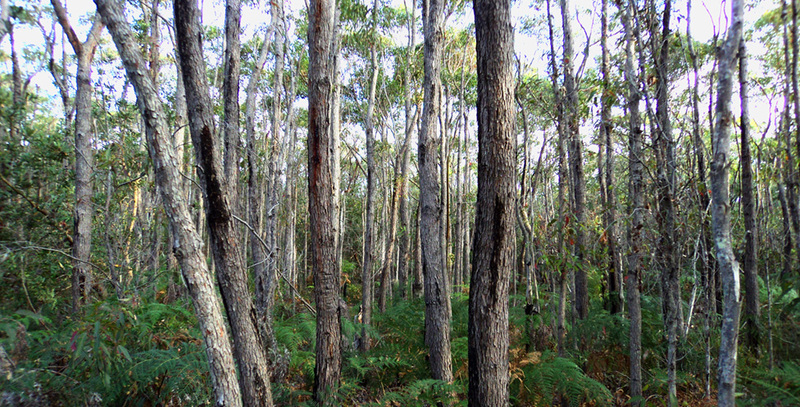 The mallee eucalypts in Royal National Park, and notably these mallee Bloodwoods, extend the range of species and adaptations of that conserved in the Greater Blue Mountains World Heritage Area and add to the representative examples of the dynamic processes in eucalypt dominated ecosystems and the range of interactions between eucalypts, understory, fauna, environment, humans and fire. 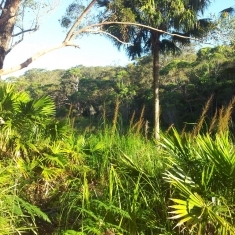 These special communities may well be not only an outstanding ecological phenomena but also a cultural effect as a result of interaction of the plants with Aboriginal communities intensifying their burning of the landscape beginning around about 10 000 years ago when the sea level began rising. At this time the seashore was many kilometers to the east and much lower. As the sea level began to rise and fluctuate in its level the seashore moved closer to its present location and fluctuated with the rise eventually to reach its present location. There would not have been very many Aboriginal people in this area before the sea level rose to its present location. They would have followed the seashore in and with its fluctuations in location practicing their cultural land management activities as they went. The seashore would have provided their main supply of food in an otherwise relatively barren area. They made a practice of burning the landscape regularly for a variety of purposes. As more people moved into the area, it is likely that there would have been an increase in this burning practice. 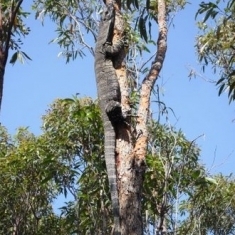 Many of the individual Bloodwood mallees with the biggest lignotubers are likely to be very old in the order of thousands of years old probably stemming from around the time of arrival of the coast line and the following increasing number of Aboriginal people. Aboriginal land management practices notably burning have quite likely contributed to their structure and great size. An understanding of the cultural context of this area in Royal National Park is fundamental to the protection of its integrity. Aboriginal People of the Dharrawal language group continue to have a custodial and managerial relationship with the area with Aboriginal People appointed as officers of the National Parks and Wildlife Service administering the area, which is very rich in occupation sites, rock art and other features providing physical evidence of the longevity of the strong Aboriginal cultural connections to this land. This would certainly have included their land management practices including periodic burning. The Aboriginal People wish to play a greater role in the management of these areas and begin to reestablish some of their past practices. It may well be necessary to relearn their fire culture in this area and reestablish it as part of the management of the integrity of the communities it supports and as part of the fire protection plan for the community of Bundeena. The changes in sea levels, changing proximity of the seashore, salt laden winds, increased wind exposure, alterations to the fire regime and changes wrought by Aboriginal land management practices would have brought about many alterations to the structure and function of ecosystems in the area and tested the evolutionary adaptiveness of their species. Scientists are beginning to understand that living organisms constantly monitor and literally analyze their environment and generate responses to changes. Some now believe that species can remake their genome in order to alter their physical form. And this solution? It can be passed on to their descendants. In essence, this is the passing on of acquired characteristics, something Lamarck insisted was possible and that neo-Darwinists have ridiculed ever since. 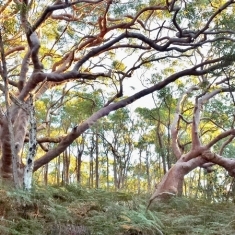 The ecology of the mallee Bloodwood here with its gigantic lignotubers is an outstanding example of dynamic evolutionary processes in Australian and eucalypt-dominated ecosystems contributing to Criterion (ix) for World Heritage Listing. It offers superb opportunities for research into these phenomena. A small number of Bangalay Eucalyptus botryoides trees can be found in this area and indicate the possible existence of remnants of Bangalay Forest. 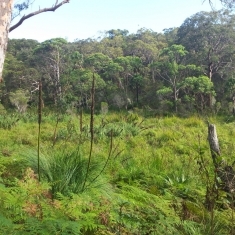 These are geologically recent plant communities evolved in the last 10,000 years and they add to the great diversity of outstanding examples of dynamic evolutionary processes in Australian and eucalypt-dominated ecosystems contributing to Criterion (ix) for World Heritage Listing. Laterite occurs in a number of places here on the cliff tops along the immediate coastline, e.g. Jibbon Point. The origin of this laterite is controversial and a number of conflicting theories exist explaining its occurrence ranging from its being a relict of past climates to its being a result of current and ongoing climate and soil interactions. Its presence on the coast cliff tops adds to this mystery and complexity. 1. Bryant, E.A., Young R.W.. Price, D.M., and Short, S.A. Late Pleistocene dune chronology: near-coastal New South Wales and eastern Australia. Quaternary Science Review. Vol 13, 1994, pp 209-223. 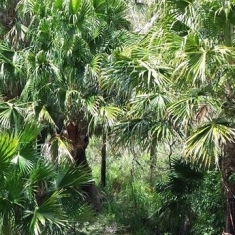 ‹ Urban Protected Areas – Important for people and nature.